With Thanksgiving just around the corner, the reflection on all that we have to be grateful for is hopefully turning your thoughts to more than just the long lines at the grocery store and a sink full of dirty dishes. Along with thawing the turkey, put a trip to the local florist on your “to do” list in the coming weeks and find yourself standing with flowers at the front door of a friend or family member in your life for whom you are thankful. You’ll be surprised how much this simple gesture can put you in the spirit of the holiday and leave you feeling more fortunate than ever. In the Victorian language of flowers, there are many blossoms that represent gratitude and graciousness, but few that will be lovelier this month than the camellia. 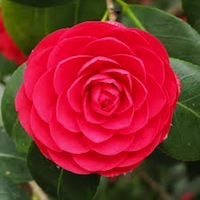 Native to parts of eastern and southern Asia, there are hundreds of different species of camellias. This medium-sized, evergreen plant is actually a woody shrub with glossy, green leaves that stay green and fresh through the cold winter months. Several different varieties bloom in the late fall through very early spring in the warmer, southern regions, where many different hybrids exist. Selectively bred for centuries for their large, round blooms, most have an almost rose-like look with their double sets of petals opening up to a cluster of yellow stamens. White, pink and deep magenta blooms form along the woody stem of the plant and open from perfectly round buds. The blooms themselves can be over 2 to 3 inches across in diameter and are often framed by the glossy leaves for a look that is stunning floated in a glass vase like a votive. A single stem with several bloom are a sweet gift to leave on a doorstep, but the leaves themselves are an excellent way to dress up a table as well. Highly prized as an ornamental, the camellia has another very important commercial use. One species, the Camellia sinensis, is the source for tea. The plant is grown around the world in tropical climates where the top few leaves of the branching shrub are picked and dried for use in black and green tea. Both types of teas can be produced from the same camellia plant, but the young leaves of green tea are typically steamed, while black tea is left out to dry and fully oxidize. Why not bring some camellias over for tea with someone you’ve been meaning to thank this season.